At least 6 of the best hotels in Bangtao Beach Phuket feature in the Laguna holiday complex settling amid peaceful lakes and island greenery toward the north of the beach. It includes fabulous luxury resorts like Dusit Thani, the family friendly Angsana Laguna and Outrigger Laguna, the romantic pool villas at Banyan Tree and the 4 star Allamanda Laguna. Laguna hotels offer such an array of recreational facilities like pools, water slides, kids clubs, the finest spas, restaurants and championship golf course that venturing out becomes almost unnecessary. Plus, staying in any one of it's venues you can use the facilities of any of the other in the complex including restaurants and simply charge to your room. There are also special family events annually, normally during July | August. Further north is the romantic Pavilions Resort featuring heavenly private pool villas. South along this curving 8 km bay are affordable 4 star beachfront hotels like Best Western and Sunwing Resort and spa, the latter especially recommended if you are traveling with small children featuring welcome additions like baby high chairs, baby baths and cutlery, and rooms with enclosed gardens. 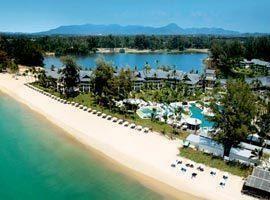 Bangtao Bay is located 25 minutes from Patong in Cherng Talay, Thalang district. The area feature some bars and restaurants, but besides these it is otherwise devoid of crowds and is generally relaxed. Amora offers tastefully decorated superior and deluxe rooms with private balconies as well as one bedroom suites with separate living areas. 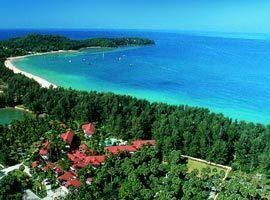 The Coral and Andaman Suite offer 2 bedroom accommodation. Angsana Laguna enjoys an oceanfront setting second to none. Settling on the banks of placid lakes it offers the ideal 2 bedroom family accommodation as well as romantic poolside rooms for couples. 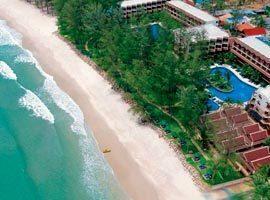 Located 10 minutes from the Laguna Phuket Golf Club Best Western enjoy a stunning ocean-front setting. 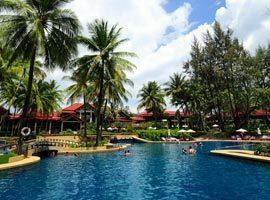 It offers 2 swimming pools with a swim-up bar, kids poo, fitness centre and water sports. The ultimate 5 star accommodation which include romantic sea view rooms and rooms overlooking placid lakes featuring private balconies, as well as the 2 bedroom Laguna Pool Villa and Oceanfront Pool Villa. Outrigger offers deluxe lagoon view or ocean view rooms as well as 2 bedroom suites and villas. 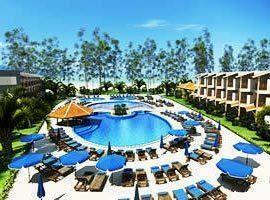 Facilities include a pool, kids pool and kids club. There is also fitness centre, dive centre and 5 restaurants. A great place to stay for families with small kids and teenagers. It offers a wealth of entertainment for children and thoughtful extras for toddlers and babies in their Happy Baby Studio and Family Suite.